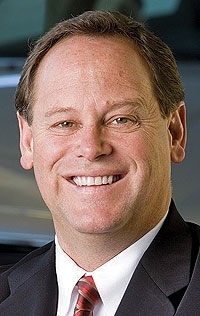 DETROIT — Volvo Cars of North America bought out 25 franchises in major markets last year as part of a consolidation to adjust its network size, said CEO Doug Speck. The cut brings Volvo to 330 franchises in the United States, Speck said at the Detroit auto show. The stores that closed were selected based on volume and Volvo's plans for growth, he said. Nearly every major market was affected, Speck said. "We took a clean sheet of paper, looked at the top 20 markets and said, 'Based on what we know of our plans and what we know of our competitors, how many outlets do we need and where should they be located?' " he said. Volvo decided it had too many dealers in nearly every top market — and even in smaller markets such as Dallas and Atlanta. The cuts, which Speck said were voluntary, leave Volvo with 140 stores in its top 20 markets, which account for 60 percent of U.S. sales. "We were pretty close to cutting at least one in each market," he said. Speck said Volvo told dealers about plans and said to them: "This is clearly voluntary if we can reach a solution. If not, we'll work together to make you profitable." The affected stores all closed at the end of 2008. Said Speck: "The network is better positioned to have stronger dealers in the top markets. We will have a 10 to 15 percent improvement in throughput without any volume change." Because the dollar has weakened, Volvo returned to leasing its three smaller cars — the S30, S40 and V50 — toward the end of last year. The brand expects that increase in volume to drive 2009 sales, said Speck. "They were the ones that didn't have leasing for most of the year, and our allocation was cut 50 to 55 percent on average in those lines, and the segment was down closer to 25 to 30 percent," he said. Speck said Volvo will show flat sales in 2009 primarily because of an anticipated decline in fleet and rental sales. "Our objective is to grow in volume even though the industry and our segment will be down," he said. "The retail channel volume will grow — we will sell less to fleets and rentals." Last year, Volvo sold 73,102 units in the United States, down 31.2 percent from 2007. This year, Speck said a larger proportion of sales will be retail units — about 65,000 vehicles, compared with about 59,000 in 2008.